Why do these Dothraki look calmer than expected? Game of Thrones spoiler ahead! Why do the Dothraki look calm in the ship? 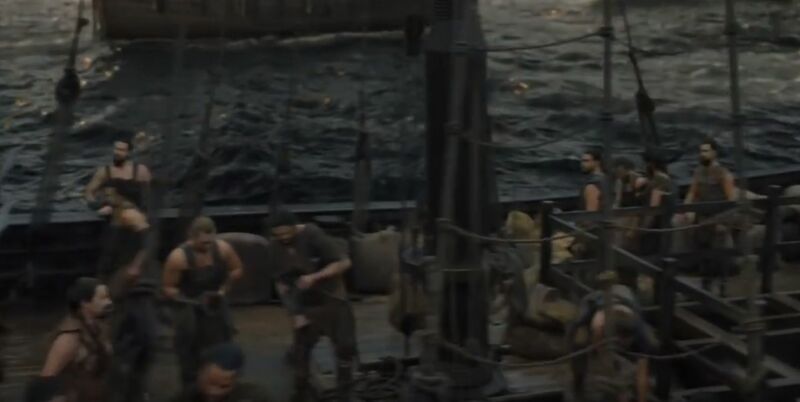 In the final episode The Winds of Winter (S06E10), a short moment struck me, when we briefly see the Dothraki working in a ship. Here is the scene. That scene doesn't feature in the books, where they are supposed to be more scared of sea water than death but I don't remember if this fear is mentioned in the show. This isn't the only confusing thing about this scene - people also get confused about Varys suddenly turning up at the end. Half the answer to this I think is the same as to that - a heck of a lot of time has passed between this scene and the battle at Mereen (it'd be nice if they had communicated this more clearly than just having some sails in the fleet which, if you look closely, have Dornish and Tyrell sigils on them... but anyway...). Last time, they were genuinely terrified, travelling over the notorious poisonous waters in a strange, rickety wooden horse, doing something completely alien to their people. This time, those survivors from the Khal Drogo days have been there, done that, and can set an example for the others. And this time, they are a true khalasar with a leader who proved herself strong, riding to war like thousands of Dothraki have done proudly for centuries before them. They may be doing it in an unusual way, with wooden horses instead of horsemeat ones, but this new way is tried and tested now. By the time this scene happens, they've had plenty of time at sea to get used to it and (figuratively and literally) learn the ropes. It'd be strange if this time, they weren't posing, acting tough, trying to out-sailor each other, competing to be the best wooden-horse rider in the army, mocking the weak who still struggle. They were scared of the sea water but they would have travelled if their khal had ordered them. We also know that Dothraki men are proud and dont show their fear easily. Again from the same chapter, we get to know that Dothraki panicked when the ship was stuck in a storm. We don't know how many days Dothraki men have spent on the ship. They might have been trained for few days to help around in the ship. Dani ordered them to travel in the ships (wooden horse) and they have been trained a bit to help around in the ship. We're now approaching the realms of the series leaving the book narrative. This goes hand in hand with smaller inaccuracies like Dothraki not spewing their guts out on a ship to a giant standing around rather useless in a battle because if he actually had a shield and/or a weapon the battle of the bastards wouldn't be an interesting thing to watch because he would just wreak havoc upon the Bolton soldiers. As sad as it is, this is just an example of a growing lack of details. Don't get me wrong, GoT is still one of the best series ever made but things like that bother many fans not to mention other things like that noone ever uses shields properly, while in reality people would rather throw away their swords than their shields, especially against enemy archers (which is by the way something nearly all medieval-themed movies have in common). How does Varys travel so fast? Why do the Thenn have these lines on their heads? Was Stannis expected to pay the existing debts of Westeros? Why does Jaqen H’ghar still look like this guy? The Dothraki cut their braids after defeat in battle, but when would a Dothraki be spared after being defeated? Why were these characters not hurt after their jump? Why does Euron Greyjoy want to kill these people? Why would Dany enter into an alliance with these characters? Where do the Dothraki keep their weapons if not in the sacred city? Where were these characters during their conversation? What happens if a Dothraki Khal goes bald naturally?